Flag collectors talk about the parts of flags using certain terminology. This guide will help you understand the meaning and proper usage of common terms used to describe flags and their attributes. Canton. The canton of an American Flag is the blue background and stars in the upper left quadrant of the flag. It consists of the "field" and the "stars". 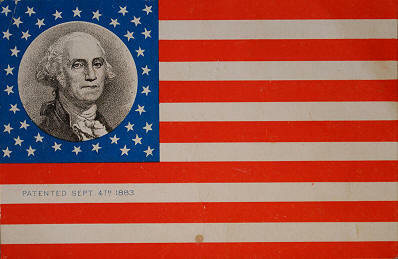 Usage: "The canton of this rare 38 star flag advertising card features a beautiful portrait of George Washington." Field. The field is the background upon which the stars are set. The field on American flags is typically blue, but can vary and shade from very pale gray to deep blue to near black. Usage: "The field of this 36 star flag is a beautiful cornflower blue." Hoist. The hoist is the part of the flag along the left side that contains the hardware used for raising the flag, and which is fixed to a pole or staff when the flag is in use. The term is also used to describe the vertical height of the flag. 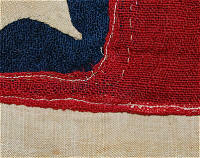 Usage: "The hoist of this 36 star flag is a sleeve, through which a braided hemp rope is passed." Usage: "The flag is 54 inches on the hoist." Fly. The fly end of the flag is the end that is allowed to wave freely when the flag is raised. It is also a term used to describe the horizontal length of the flag. 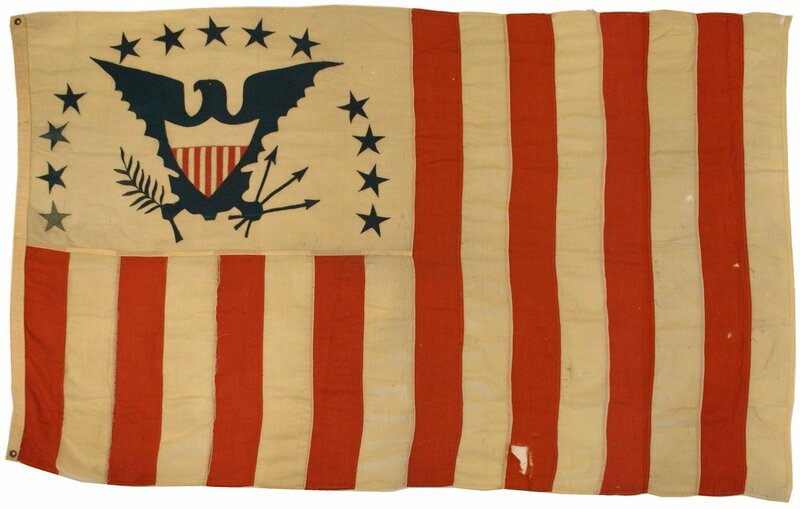 Usage: "The fly end of this 34 star flag is turned back and hand sewn." Usage: "This flag is 105 inches on the fly." Stars. The stars are a geometric multipoint figure usually having symmetrically projecting points. They are often symbolic of celestial stars. 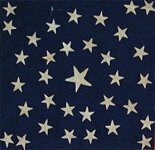 Five pointed stars are typical on American flags, though rare flags with stars of four, six, seven, eight or more points are known. 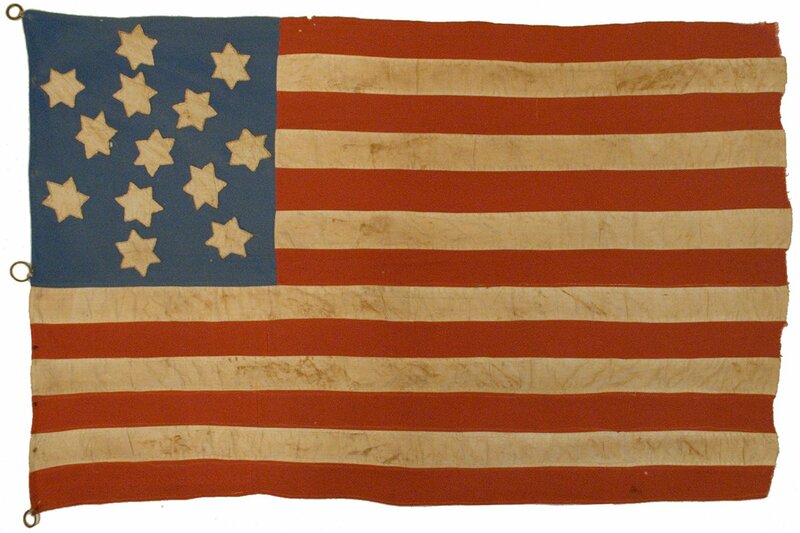 Usage: "The stars of this rare 13 star flag of the Civil War era are six-pointed." Stripes. The stripes are the horizontal or vertical red and white alternating pattern to the side of and below the canton. Usage: "The sixteen stripes of this American Civil Flag run vertically and represent the sixteen states in the union at the time when the flag's design became official in 1799." Center Point. The center point of the flag is the point where the lower right portion of the canton meets the stripes. Usage: "The center point of this 25 star flag shows the rare trait of the canton having been inserted into the red stripe." Grommet. A grommet is a reinforced hole in the hoist of a flag through which a rope can be passed or to which ropes can be tied in order to raise the flag. 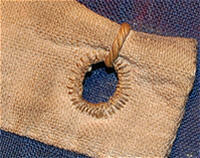 Specific types of grommets include "metal grommets", and "whip stitched grommets". 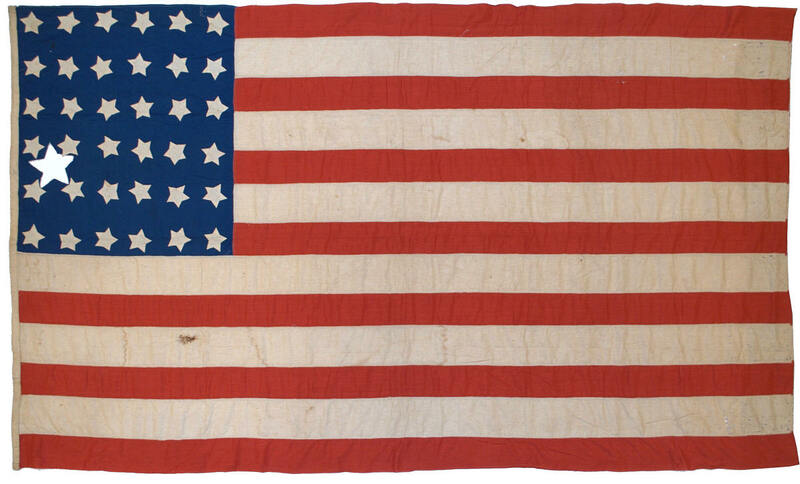 Usage: "The whip stitched grommets of this 35 star flag are hand sewn." Ring. A metal ring sewn into and extending from the hoist, through which a rope is passed or to which a rope is tied in order to raise the flag. 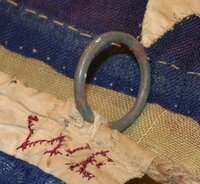 Usage: "A ring is sewn to the hoist of this hand sewn 45 star flag as another means for securing the flag to a flag pole. Sleeve. A sleeve is a specific type of hoist such that a pole can be inserted along the length of the hoist. 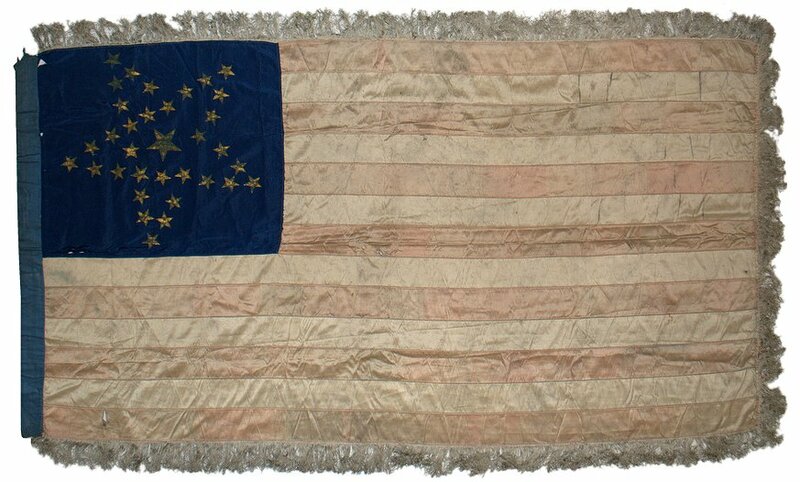 Usage: "A soldier would have inserted a wooden staff into the blue sleeve on this 34 star Company Battle Flag of Company L, 102nd Pennsylvania Volunteers when it was carried during the Civil War." Cord and Tassels. A cord is a braided rope with a decorative fringed knob, known as a tassel. The tassel is often made of fabric-covered wood. The cord and tassels hang down from the top left corner of the hoist. Usage: "This red, white and blue cord with beautiful tassels belong to the 34 star Battle Flag of Company L, 102nd Pennsylvania Volunteers." Fringe. 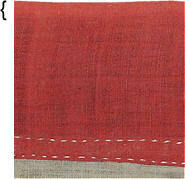 Fringe consists of braided strands sewn around the edges of a flag added for decorative effect. Usage: "The alternating red, white and blue fringe along the borders of this 38 star flag have a beautiful decorative effect." Selvedge. The selvedge is the reinforced border or edge of the fabric, created as it is produced on a loom, which keeps the fabric from unraveling or fraying. Experienced flag makers use the selvedge on the outward edges of the top and bottom stripes to strengthen the edges and prevent fraying. Consequently, the presence of selvedge on the top and bottom stripes is a good indication that a flag was made by someone experienced. 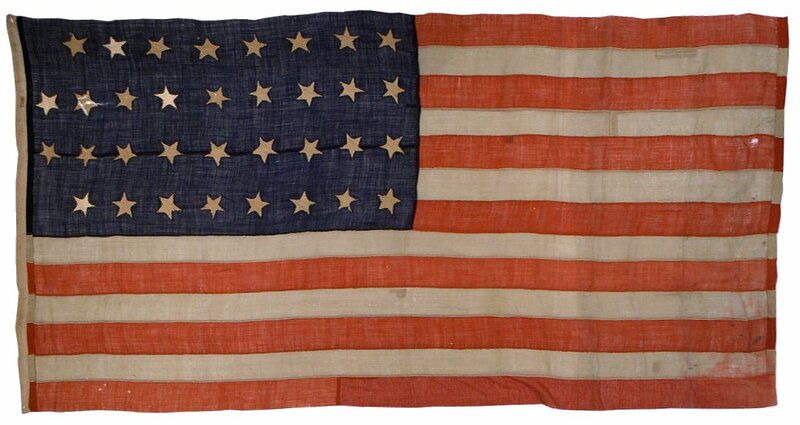 Usage: "The selvedge of the fabric of this early 27 star flag can be seen along the edge of the top stripe." Gusset. Gussets are additional pieces of fabric added to the stress points of the flag, usually in the corners where the canton meets the hoist, that reinforces the flag to prevent tearing. 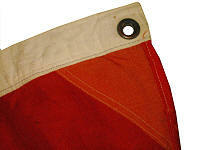 Usage: "The gusset reinforces the bottom red stripe at the point where it is sewn to the hoist." Stenciling. The practice of using stenciled templates to paint or mark text onto the flag, usually on the hoist. Stencils most typically show the manufacturer of the flag, the size of the flag, or, in rare cases, patent information. Usage: "The stenciling on the hoist of the flag indicates that the flag was made by W. M. Horstmann Company, Philadelphia, Pennsylvania." Maker's Label or Maker's Tag. A printed tag sewn or glued to the hoist of a flag that provides information about the manufacturer and often about the characteristics of the materials and coloration of the flag. A characteristic predominantly from the 20th century onward, their style and text can be useful for attributing and dating 20th century flags. Usage: "The maker's tag on this yacht ensign indicates that the flag is constructed of double-warp all wool bunting."